Back in my high school, and maybe yours too, kids naturally separated into cliques—jocks, punks, preppies, hippies, and at the extremes of the mythical left- and right-hemisphere brain spectrum, nerds and the artsy types. The latter two never spoke to each other. The rest of us rarely talked to either of them. Too bad. We all shared more than we realized. Similar thoughts had simmered for years in Whitney Bernstein, a graduate student in the MIT/WHOI Joint Program in Oceanography. So she initiated cross-clique conversations with Michael MacMahon, an art student, and Lizzie Kripke, who studies neuroscience and painting. Together, they fashioned an experiment called Synergy: Take eight artists, pair them with scientists, and get them talking with each other to create science-inspired works of art that could also spark interest in science in others. 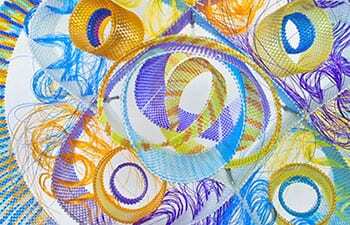 The art that has emerged will be displayed Feb. 16 to June 2, 2013, at the Museum of Science in Boston. Participating artists and scientists will convene at the museum for panel discussions and tours, 1 to 3 p.m., March 3. That’s the short story. You can read a longer one here. And you can view multimedia profiles of the scientist/artist pairings produced by Ari Daniel Shapiro and Amanda Kowalski—four presented below and four others here. Shapiro earned a Ph.D. in the MIT/WHOI Joint Program studying killer whales and has since become a journalist/artist telling science stories, a living example of how the twain can meet. Sophie Chu studies ocean acidification and its impacts on marine life. Karen Ristuben creates multimedia artworks to expand efforts of scientists working on issues of ocean contamination and public health. Larry Pratt, a physical oceanographer, uses chaos theory to investigate the fluid dynamics of eddies. Anastasia Azure combines weaving and metalsmithing to make jewelry and sculpture. Katie Shamberger, Hannah Barkley, and Alice Alpert study climate change’s impacts on coral reefs. Tristan Kading studies links between oceans and volcanoes. Shawn Towne is a digital media artist who uses sound, light, and video.